note: This article was written by Cyril Abati, for any use or reproduction of this article please adresse him. All the painting seen in this article was also done by Cyril Abati. This article was translated from french to English by Arthur Muguet ( FrenchKid) NMM by Cyril Here’s a subject with a unusual name often brought up on the different painting forum, this technique is directly inspired from classical painting, in stead of of using paints with metallic pigments, the shadows and reflection of the metal will be represented in a purely pictural way. 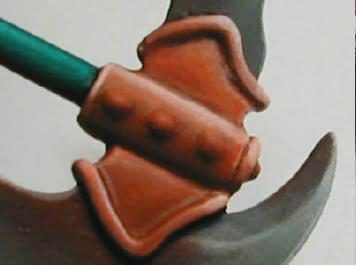 In short, it’s a 2D painting technique used for 3D !!! 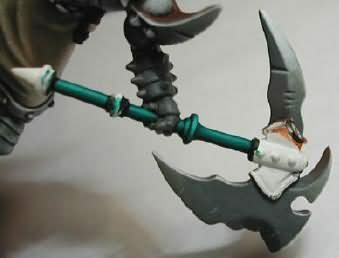 It’s by finding a mini that I had started 2 years ago that I had the idea of this small tutorial. 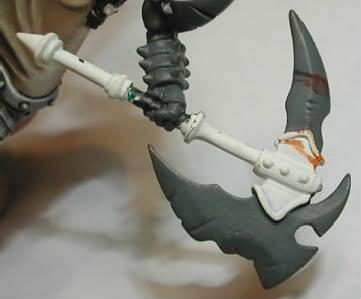 I will not be talking about the painting of the whole mini but only of one of the weapons, an axe. 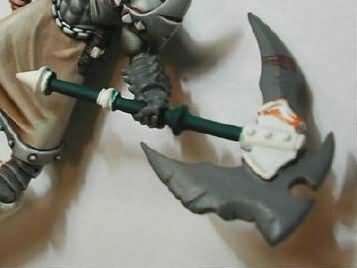 1- here is the axe undercoated with a spray white primer, I painted the blades in codex grey will I was working on the armor ( I also put a bit of another color on it by mistake). 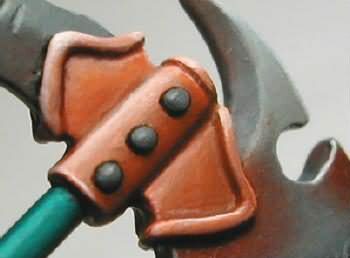 The boundary between the hand and the handle of the axe is painted in diluted black. 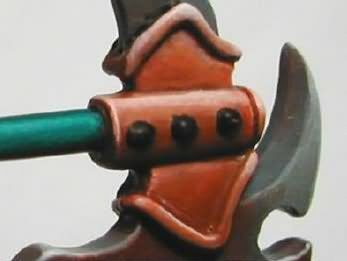 2- The shaft is painted in scaly green +black (80/20) . 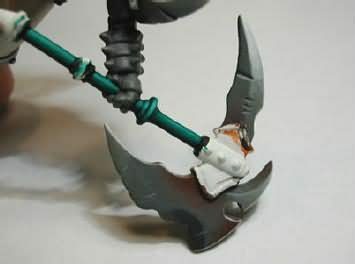 I leave a thin black line to outline the junction between the hand and the shaft. 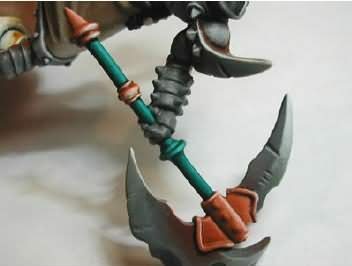 3- I used scaly green for the first highlight, diluted with water and applied with the side of the brush. 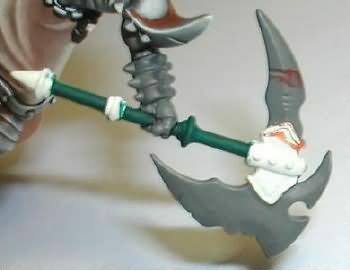 4- I progressively add white to the scaly green 5-here is the finished shaft, the final mix is aproximatively scaly green/ white 70/30. 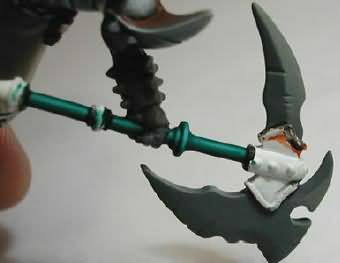 I put on a very light glaze of scaly green to blend the different tints and to remove the chalky aspect due to the white. 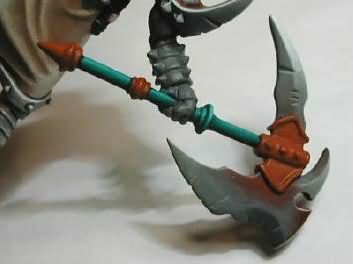 6- After having recovered my mess ups on the blades with some codex grey, I start the highlights with a mix of 50/50 codex grey/ roting flesh on the part that are the most susceptible of receiving the light and to reflect it. 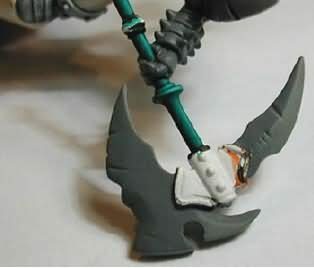 7- I keep on highlighting up to pure codex grey / roting flesh 8- I then add some white to the mix, and I progressively add more ‘light’ I also bring out the border of the blade with almost pure white. 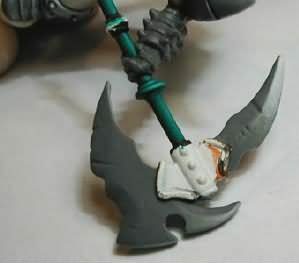 9- Opposite operation, here I add some black to the codex grey to shade the partes that re in the shadows, usually located opposite or just under the lighted parts. 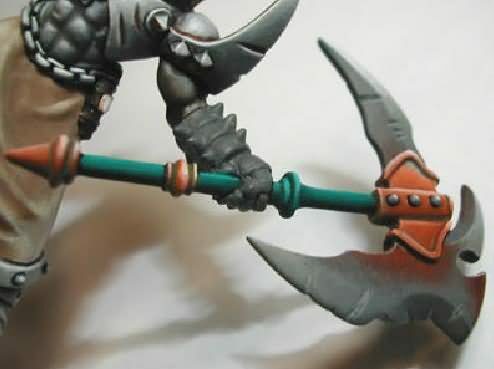 10- I add some rust, with diluted dark flesh, I finished the blade, I only have the copper parts left that need, of course, to be outligned with diluted black. 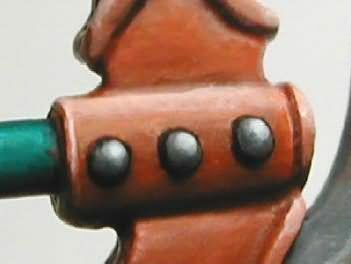 11- Base of vermine brown, applied in a couple of layers. 12/13- Fist highlights with bleached bone (90/10) I then progressively add white to the mix. The shadows are created with dark flesh in the vermin brown. 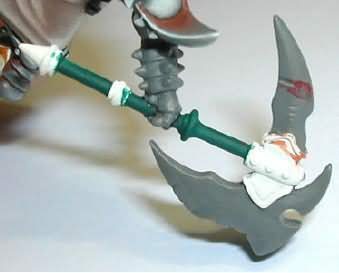 14- the bolts are darkligned in black 15- then painted in codex 16- Highlighted with codex grey _ white to creat the volume, you can also add a small white point to mark the refelction 17- The vert de gris is made like it’s name says with a mix of goblin green and codex grey, I then added a bit of white to the mix to add different hues to the oxidation.